Louis XVI style chest of 2 drawers. Ivory finish with gold shlag accents. Inspired by the French Louis XVth original, this truly Classic writing table has its all…an inset leather top; cast brass surround; shaped oak-lined drawers to the frieze and slender cabriole legs embellished with cast brass mounts. Inspired by the French Regency, this truly classic writing table has it all…an inset leather top; cast brass surround; shaped oak-lined drawers to the frieze and slender cabriole legs embellished with cast brass mounts. An impressive and superb quality French Louis XV style bombe-fronted commode. 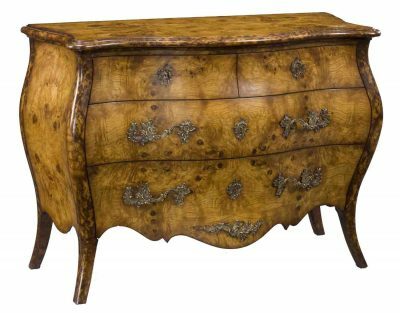 Veneered in the finest figured burr walnut it is completed with faithfully copied traditional cast brass ornate handles and supported on slender swept feet. Louis XIV chest of 4 drawers. Ebonized rub thru finish with antique gold schlag accents. Fine cast brass moldings and brass handles in paris finish. A perfect combination of elegance and personality, this furniture will give your abode a touch of distinction. This double-drawer nightstand is the perfect accessory for the Helium bed. By adding this designer nightstand to your bedroom furniture you will complete the perfect setting for a modern and contemporary housing environment. Providing ideal storage for all the items you might need, the extraordinary German design and Austrian craftsmanship combine perfectly and merge together to give way to a perfectly shaped and integrated structure. Available in two kinds of wood (oak and walnut). Side panels can be ordered in leather or in wood. Precision and aesthetics will rule in your living room as this designer entertainment unit will reflect the functional beauty of German design and Austrian craftsmanship. Louis XVI console table in solid walnut wood. Pompei red finish with antique gold schlag lining.